MR-based integrated isolators and circulators provide high isolation with the lowest insertion loss, however, they provide only a narrow isolation bandwidth (GHz). A schematic and 3D geometry of a microresonator-based isolator are shown opposite, together with isolation measurements. Devices fabricated at UCSB demonstrated optical isolation of 32 dB, with a loss, when scaled for the test geometry, of 2.3 dB. A unique feature of the MR-based isolator geometry is that the light from the laser (blue arrow) passes through the bus waveguide, and in the transmission mode it barely interacts with the MO material; therefore, for a fully optimized device it may be possible to reduce the insertion loss down close to that of the silicon bus waveguide alone. Reflected light (red arrow) passes in the opposite direction around the microresonator. The NRPS is used to align maximum transmission through the device for the forward laser light and at the same time a transmission minima for the backwards, reflected laser light, providing optical isolation, i.e. 32 dB from the blue curve to the red minimum at the operating wavelength. 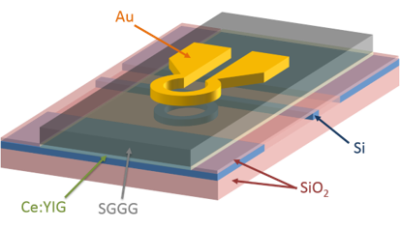 ​Another unique feature of the integrated isolators and circulators developed in this program is the use of a gold microstrip above the MO material, in which a current is passed in order to generate the required magnetic field for device operation. This approach, using an electromagnet to create the required magnetic field, has been validated by numerous device measurements, and then optimized through the use of multiple coils to reduce the power associated with the required magnetic field to only 3mW. 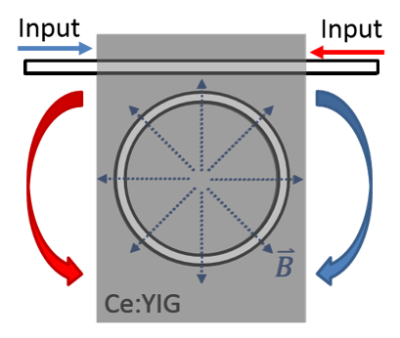 The direction of the magnetic field can be reversed by reversing the current direction, so that a reconfigurable multi-port circulator can be fabricated. 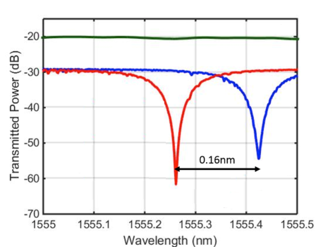 MZI-based integrated isolators and circulators can provide high isolation over a relatively large wavelength range, however, the trade-off is a significantly larger optical insertion loss. In RF Photonics applications this large insertion loss from these devices makes them impractical for use in high performance PICs and systems. A schematic and 3D geometry of an MZI based optical isolator/circulator is shown opposite. Using these designs, record results have been achieved, e.g. 20 dB of isolation over 18 nm bandwidth, that is tunable over 100 nm, however, the loss these devices is much higher, at 9 dB. Ongoing materials development and device optimization should, over time, provide improved MO materials and devices, allowing improved performance from the MZI based isolators and circulators. Due to the geometry of the devices shown so far on this page, fabricated by wafer/die bonding of Ce:YIG on top of the silicon waveguides, these devices work as isolators and circulators only for the TM polarization mode. However, most integrated lasers operate in the TE polarization mode. A TE polarization mode isolator or circulator would require the MO material to be placed on the edge of the waveguide rather than on top of it, and therefore cannot be fabricated through wafer/die bonding. Deposition techniques such as pulsed laser deposition (PLD) or sputtering for the MO material are being worked on, including in this program, however, results are currently far worse than can be obtained with wafer/die bonding, and useful isolation devices have not yet been achieved. In order to develop a TE mode isolator and circulator the MP team combined a TM mode isolator/circulator devices with TE to TM mode polarization rotators. For an isolator this requires a TE mode laser to be followed by a TE to TM mode rotator, followed by the TM mode isolator, followed by a TM to TE mode rotator, in order to provide a TE polarization mode output for use by following components on a PIC. These multi-element TE mode isolators and circulators have been demonstrated; the TE mode circulators being the first of their kind to be published.